Saoco! 2 is a fascinating and important listen, and should appeal equally to music historians and amateur salsa enthusiasts in the Caribbean and beyond. Somewhere between acquiring the CD and writing this review, Saoco! 2: Bomba, Plena, and the Roots of Salse in Puerto Rico has earned a privileged spot in my high rotation, with its pulsing rhythms, searing horns and infectious beats offering a steady dose of fun and intrigue for several months now. The collection chronicles Puerto Rican popular music between 1955 and 1967, revealing Puerto Rico as something of a musical melting pot in this era, with its musicians drawing on a wide range of influences from Brazilian samba to American rock and roll. Although this collection no doubt reveals the roots of salsa music in Puerto Rico, it also reveals the complex development of cultural identity in the Caribbean at mid-century. 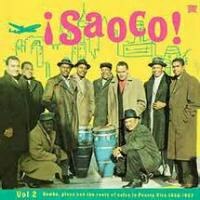 While these musicians were informed by emerging trends in Havana and New York, there is something distinctively Puerto Rican about their sound, as the influence of island genres such as bomba, plena and musica campesina can be heard throughout the collection. Saoco! 2 is a fascinating and important listen, and should appeal equally to music historians and amateur salsa enthusiasts in the Caribbean and beyond.